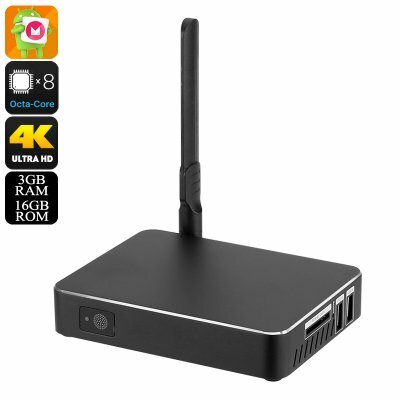 Successfully Added A200 Android TV Box - Amlogic S912 CPU, 3GB RAM, Mali GPU, Dual Band Wi-Fi, 4K, H.265 Decoding, Kodi, Miracast, DLNA, Airplay to your Shopping Cart. The A200 TV box has a metal body for better cooling and adopts a minimalist design, however, a glance under the hood and it's obvious that the specs are anything but. This smart TV box is powered by the mighty Amlogic S912 octa-core CPU which is dominating the Android TV box market and supports 4K H.265 decoding. With the Mali T820MP3 GPU and an impressive 3GB of RAM, you're in for a superb performance that renders high-resolution movies and graphic rich games without dropping frames or lag. This TV box supports a huge range of media files and the Android Marshmallow operating system is the perfect platform to enjoy your media. The renowned Kodi media player is preinstalled and with apps like Hulu and Netflix from the Play store, you'll have no shortage of options to watch the latest sporting events, movies or TV shows. Having dual-band 2.4G and 5G Wi-Fi brings greater choice in where you can place this TV box as it needn't be next to your router to download and stream media or play games online. When it comes to storage options there is 16GB of memory on this smart TV box and a micro SD card slot offers a quick and easy way to add an extra 32GB of space. Alternatively, you can use one of the 3 USB ports to connect a memory pen. Additional features include SPDIF for superior audio output as well as Bluetooth 4.0, DLNA, Miracast, and Airplay. The A200 Android TV box comes with 12 months warranty, brought to you by the leader in electronic devices as well as wholesale TV boxes and media players..